A Porsche Boxster with an inferior roof mechanism. Of course not. 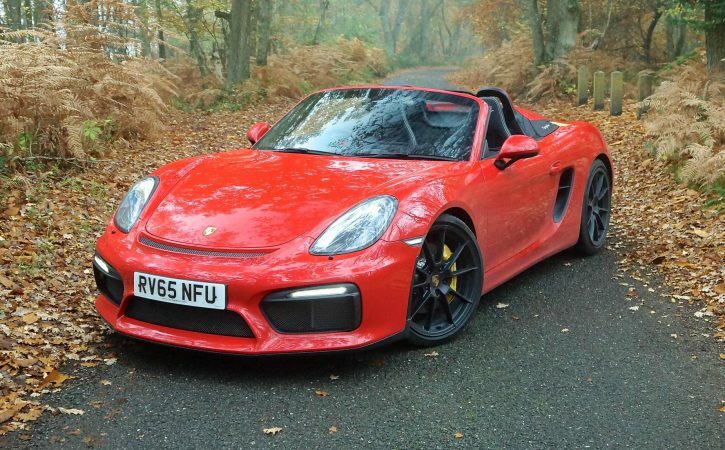 Being uncharitable, the Spyder is a mish-mash from the Porsche parts bin: drivetrain from the Cayman GT4, suspension from the Boxster GTS, electro-mechanical power steering from a 911 Turbo, brakes from a 911 Carrera S. But not on this one, which has the optional £4,977 PCCB ceramics. I thought this was a roofless Cayman GT4? Not quite. Same engine, but detuned by 10bhp, same six-speed manual gearbox with no optional paddle alternative, but the suspension is largely carried over from the GTS, rather than heavily borrowed from the 911 GT3. Still, the Spyder is actually 25kg lighter than the GT4 (and 30kg lighter than the Boxster GTS) and this time the roof will stay on no matter how hard you drive it. Well, on the last one, the 2010 Boxster Spyder, the roof was a flimsy affair only warranted to 124mph. The new one is sturdier, and can hang on even at the claimed 180mph max. We drove the car in Italy back in the summer, but to truly test it we needed to drive it in the UK. In November. Clearly customers expect proper weather protection, but are still prepared to faff a bit to get the roof down and expose the streamliners – those are the elongated twin humps. So you use electrics to unlatch the roof from the header rail, but from then on a leg stretch is needed. You unclip the fabric buttresses, open the whopping rear deck, pull the roof back and then close it all in. You still get a boot front and back and, with a bit of practice, you should be able to get the whole job done in about a minute. Then you get to enjoy the sounds? I have to say the drivetrain is the highlight of this car, not just the sonics, but the whole operation and precision and delivery and intoxication of it. It’s just so beguiling and rewarding. The 3.8-litre engine may have originated in the relatively ordinary Carrera S, but here, open and exposed, it finds even more depth and character, and punches so hard at the top end. And you get to fully immerse yourself in the action, to bathe in the wailing waves of sound and snick about the genuinely delicious manual box. Engage Sport Plus and it’ll do the downshift blipping for you. But if you owned one I genuinely think you’d stick to Sport and try to perfect the shifts yourself. It’s that sort of car. It does the ‘Ring in 7.47, but that’s not the point at all. This is an indulgent car, one you totally engage with, relishing the whole operation of it, not just the handling’s outer limits. Is it as crisp as the Cayman GT4? No, it’s neither as sharp nor focused as that. And in fact it feels more different to it than I expected – not just gentler, but somehow more wholesome, emphatically a road car, not a track car. It still steers and rides beautifully, there’s no scuttle shake at all and it’ll go down a road as rabidly as you crave, but it’s actually nicest when you back the pace off a bit and concentrate on driving it properly, y’know getting the braking and gearchanging just so.